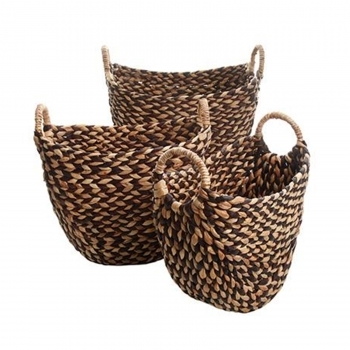 The Eco Friendly Bachman 3-piece woven set brings rustic beauty to home organization with naturally-colored woven water hyacinth. They are the perfect choice for an active home. With easy-to-grip handles, they makes clearing clutter a breeze. curved rectangular design. 13 x 7.5 x 11.5. * Baskets nest for easy storage.